CSIR Notification is out. CSIR is recruiting for 02 Technician and Junior Stenographer Post Posts. You can check CSIR - Council of Scientific & Industrial Research last date, download CSIR notification, visit CSIR official website and check other CSIR Vacancy details.Complete Vacancy and recruitment Details about 02 Technician and Junior Stenographer Post vacancies in CSIR are provided below by JobSarkari.Com only for you. Last Date for Apply Online 03/08/2018. Last Date to Receipt of Hard Copy of Application form 17/08 2018. Bank Name - State Bank of India, Taramani. Technician Candidate Must Have Passed Class 10th With Science and ITI in Electronic Mechanic / Information Technology and Electronics With Two Years Experience as an Apprentice. Max 28 Years. 01. Junior Stenographer Candidate Must Have Passed Class 12th With Typing Speed of 80 W.p.m in Shorthand and 40/35 W.p.m in English / Hindi. Max 28 Years. 01. Total No of Post 02. 1.Screening Test / Trade Test. 6.Online Application Can be Submitted on or Before 3rd August 2018. 7.Candidate Need to Send the Hard Copy of Documents to the Address Given Below. The Administrative Officer, CSIR - Structural Engineering Research Center, CSIR Campus, Post Box No. 8287 CSIR Road Taramani Chennai - 600113 On or Before 17th August 2018. Q. What is the Last Date For CSIR Technician and Junior Stenographer Post Vacancy ? A. 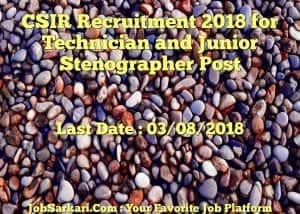 Last Date for CSIR Technician and Junior Stenographer Post Posts is 03/08/2018. Q. 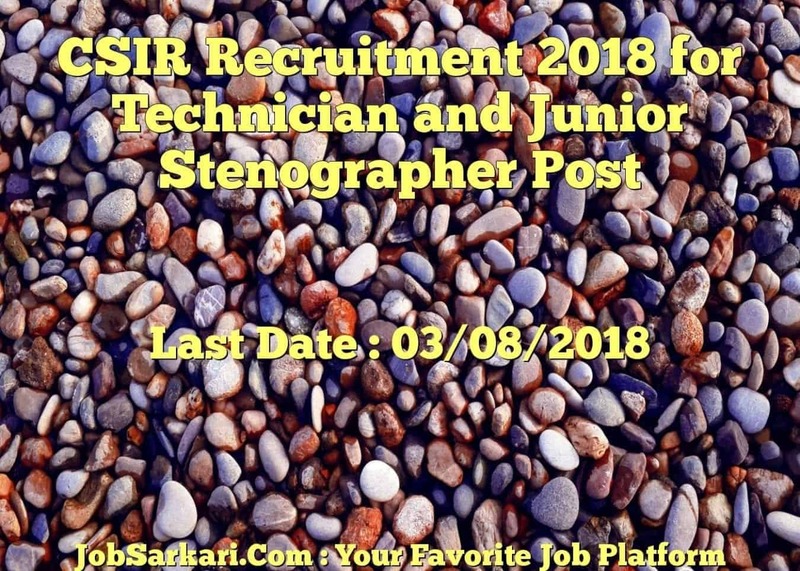 What is the Form Type of CSIR Technician and Junior Stenographer Post Recruitment ? A. The Form Type for CSIR Technician and Junior Stenographer Post Posts is Offline, Online. Q. How many vacancies are available in Council of Scientific & Industrial Research Technician and Junior Stenographer Post Posts ? A. There are about 0 Vacancies in Council of Scientific & Industrial Research Technician and Junior Stenographer Post Posts. Q. What is the Full Form of CSIR ? A. Full Form of CSIR is Council of Scientific & Industrial Research . and i am in need of job..
you Can Apply For All ITI Pass Jobs Through Links.